This Nuveen High Yield Municipal Bond Fund utilizes its assets to invest in lower rated municipal bonds. It is ranked Neutral and 3-stars rating by Morningstar. It has total net assets of $7.90 billion. The dividend yield is 6.25%. The annual expense ratio of this fund is 0.83%. This best performing high yield muni fund has average maturity of 22.33 years. The modified duration is 7.41 years. For 2012, the year to date return is 17.21%. It has 5-year annualized return of 2.33%. The top portfolio allocation as of August 2012 is Municipal Bonds (86.25%) and Inverse Floaters (11.61%). The top 3 bond sectors are Tax Obligation/ Limited (27.5%), Health Care (16.7%) and Transportation (10.7%). This Pioneer High Income Municipal Fund objective is to provide high yield income exempt from federal income tax. It has $813.59 million of total net assets. The 12-month yield is 5.67%. Morningstar has ranked it with 3-stars rating. The expense ratio is 0.88%. Timothy Pynchon is the fund manager. The CUSIP number is 72387N846. The fund’s YTD return is 15.75%. It has returned 6.23% over the past 1-year, 10.63% over the past 3-year, and 1.95% over the past 5-year. The other classes are Class C (HICMX) and Class Y (HIMYX). The top holdings are Illinois Finance (2.7%), Greater Orlando Avia (1.9%), West Virginia Hospital (1.9%), Illinois Finance Aut (1.8%), Northern Tobacco Sec (1.7%), Capital Trust Agency (1.7%) and New York City Industry (1.7%). Oppenheimer AMT-Free Municipals fund invests primarily in municipal debt securities. It may invest in investment grade or non-investment grade muni bonds. Daniel G. Loughran has managed this high yield muni mutual fund. It was first introduced to public in October 1976. It has total net assets of $2.78 billion. The dividend is 5.65%. The most recent yield was distributed in August 2012 ($0.03). The expense ratio (0.74%) is lower than the average in the High Yield Muni category (0.98%). The current shares price is $7.21. 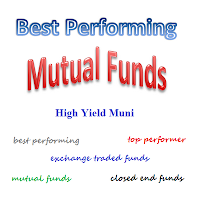 This best performing high yield muni bond mutual fund also has YTD return of 15.81%. It has 2-stars rating from Morningstar. It has 26 years of positive return since inception. The top holdings as of August 2012 are TX Municipal Gas Acquisition & Supply Corp (2.3%), Buckeye, OH Tobacco Settlement Financiang Authority (2.3%), CA Golden State Tobacco Securitization Corp (2.0%) and IL Finance Authority (1.2%). This Lord Abbett High Yield Municipal Bond fund has 13.48% YTD return. With $1.91 billion of total net assets, Morningstar analysts rate it with Negative rating. Investors of this fund gets dividend yield of 5.23% per year. The portfolio turnover as of September 6, 2012 is 40.94%. There is 0.20% management fee and 2.25% front-end sales load fee. 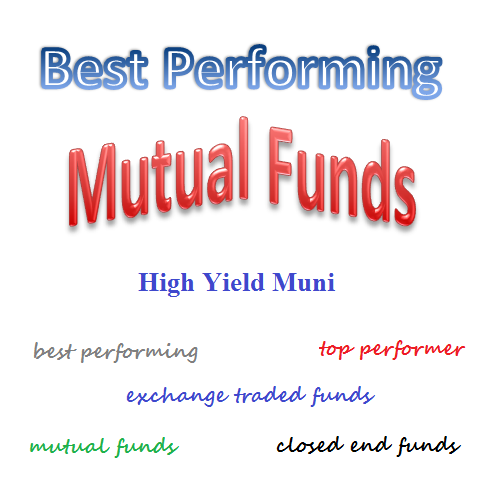 This top performer high yield muni mutual fund has its best 1-year total return in 2009. During 2009, it managed to return 35.91% per year. The largest issues are Buckeye Tobacco Settlement Finance Authority (2.2%), NJ Tobacco Settlement Finance Corp (1.8%), Golden St. Tobacco Securitization Corp (1.2%), Central Plains Energy (1.1%) and VA Tobacco Settlement Financing Corp (1.0%). MainStay High Yield Municipal Bond fund hasn’t been ranked by Morningstar. It seeks a high level of current income exempt from federal income taxes. With total net assets of $952.22 million, it has 13.31% YTD return. The dividend yield is 4.40%. You can buy this fund with $2,500 minimum initial investment. The total expense ratio is 0.90%. The fund NAV is $11.78. Last year, the fund has returned 11.79%. The CUSIP is 56063U554. Other classes are Class A (MMHAX), Class C (MMHDX) and Class Institutional (MMHIX). The effective maturity is 15.4 years. The top holdings are Clark County NV (2.0%), Philadelphia PA Hospitals & Higher Education Facilities Authority (1.6%), Vermont Economic Development Authority (1.4%), Capital Beltway Funding Corp (1.4%) and Indiana Finance Authority (1.3%).